I manfully resist picking up 78s, but a batch of discs in a charity store this month threw up a few better than average label designs which caught my eye, and in an attempt to distract myself from a grotty dental appointment, I gave in this once. Especially as the store had an ‘all albums half price’ offer on (if you’d said years ago that charity stores would charge so much that they’d end up having sales, I would not have believed you. I did needless to say check that the 78s were covered by the term ‘album’… ). 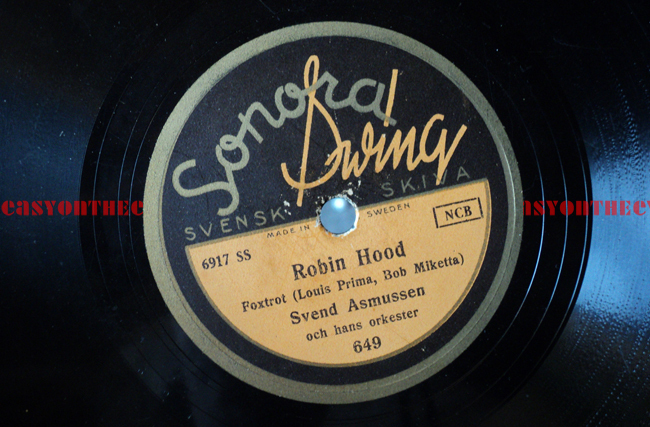 Sonora was one of the earliest Swedish record labels, begun in 1932, with their Swing series starting four years later. It’s a design very much in keeping with the times, yet with a Swedish touch about the lettering – particularly the elongated dot on the “i”. The colours are lovely; dark maroon (so dark it looks almost black) and orange (sometimes they used yellow), with gold on the border and to pick out the word Sonora. The text under the logo made me curious – it translates as ‘Swedish Disc’, the label apparently being particularly proud of their origins (another design read ‘Promote Swedish Industry’). 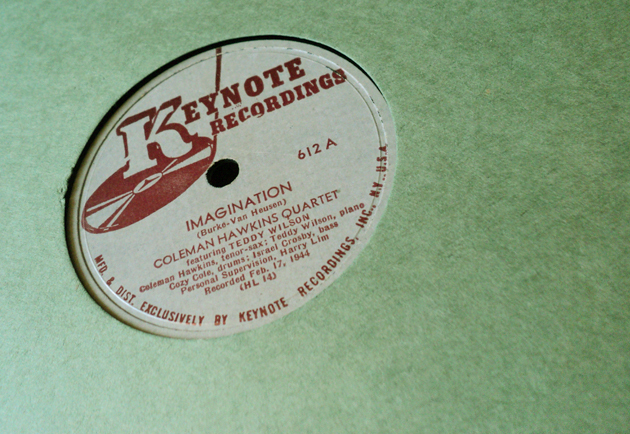 This release dates from November 1945 (there is a 1940 record bag from the label on the site here). 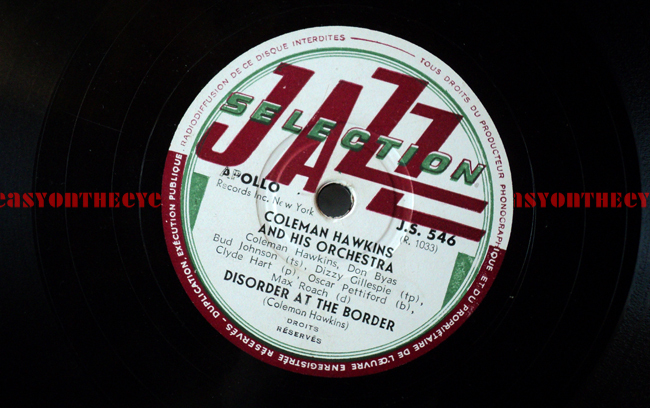 The Jazz Selection label appears to be French outfit, releasing under license some of the popular US titles of the time, this one being from 1952. The hand-drawn italic lettering is very French looking, while the overlapping of the two Z letters reminds me of those optical puzzles you sometimes see – is line A longer than line B.
Lastly the Keynote Recordings label which looks very crudely done, note the damage to the letterpress block, but I kind of liked this sort of graphic – the total lack of design in the actual logo is so naive it works. 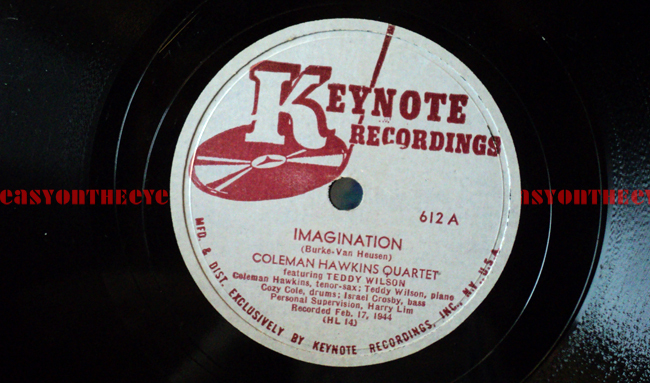 It was issued in 1944, which might explain the lack of quality control, that and the fact that Keynote seem to have been really knocking out 78s by the score at this time. The label was founded in New York in 1940 by a record shop owner, Eric Berney (who probably did the logo himself), mostly issuing folk and protest records, before moving on the Jazz in 1943. They went under in 1948.
a site which also has information on a lot of pre-WW2 Dance Bands.